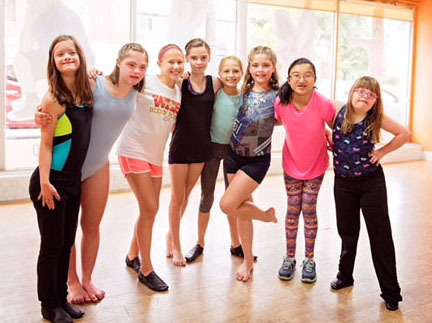 Expression Dance Studio in Westmont has been officially selected to perform at Soldier Field as part of the Special Olympics 50th Anniversary Celebration. The Special Olympics Unified Rhythmic Gymnastics Team will be performing at the Global Day of Inclusion Festival on Saturday, July 21. The team, which trains at Expression Dance Studio in Westmont, will be part of the on-field sports demos led by professional and Special Olympics athletes. "Expression Dance Studio is proud to support the Special Olympics of Illinois,” said Amber Saraceno, Owner and Artistic Director. “We instill the mindset with our dancers that we are all equal. We have been teaching dancers of all abilities since the day we opened in 2009. Starting our own team, and becoming an official training site for Rhythmic Gymnastics, has been a dream of mine for many years. Expression Dance Studio is very excited to be part of the Inclusion Revolution!" The team was recently featured in the Chicago Sun-Times video series commemorating Special Olympics’ 50th Anniversary. The Special Olympics movement got its start at Soldier Field in 1968 and is returning to its birthplace to commemorate the occasion. The Global Day of Inclusion Festival is free to all and will offer sports, interactive games, exhibits, delicious food offerings, and live entertainment. The team, which is comprised of 12 athletes from surrounding communities ages 12 and up, recently competed at their 2018 regional dance competition and raised over $1,000 for Special Olympics Illinois. Expression Dance Company and Unified dancers chose to forgo their trophies and awards and instead donate their winnings. They will present the check to the Westmont Torch Run on Thursday, July 5 at the Westmont Cruisin’ Nights and Street Fair. "I love my Unified Dance Team because we are all very supportive of each other," said team member Callie Devine. "I also love that everyone loves to dance with the entire team - it's not just a one person show." To learn more about the Special Olympics 50th Anniversary celebration, visit http://specialolympics50.org.